Carpal tunnel syndrome (CTS) occurs when the median nerve serving the hands and fingers is compressed as it threads through the wrist’s carpal tunnel structure. While a specific cause is rarely discovered, a common factor among patients involves repetitive wrist motion, such as the forceful grasping and movement of tools or other objects. Numerous medical conditions are associated with CTS, including pregnancy, use of contraceptive pills, menstrual cycles, vitamin B6 deficiency, hemodialysis, rheumatoid arthritis, obesity, amyloidosis, acromegaly and myxedema. CTS is more common in women than men with onset of symptoms typically between age 40 and 60. 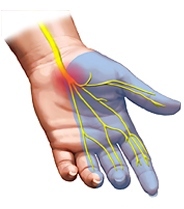 The primary symptoms are aching, burning, tingling, and numbness in the hands in the region of the thumb and first two fingers. The pain typically is worse at night. On awakening, the patient may have to shake the hand or massage the wrist to obtain relief. Strenuous use of the hand nearly always aggravates symptoms. Other symptoms include weakness or clumsiness in the hand. Two tests are used to distinguish CTS from cervical root abnormalities and tendonitis. A nerve conduction velocity (NCV) test involves electrical stimulation of the nerve to measure the speed of response. Electromyogram (EMG) measures the physiological properties of muscles during movement and at rest. If symptoms are mild or intermittent, short in duration and likely reversible, conservative treatment with rest, a wrist splint and/or anti-inflammatory medication is recommended. Surgical treatment is available if conservative treatment fails to offer sustained improvement, electrodiagnostic data confirms CTS, and/or sensory loss, atrophy or weakness is present. 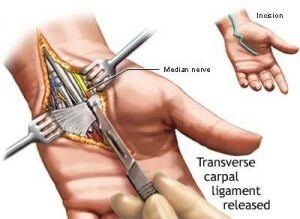 Surgery involves careful sectioning of the transverse carpal ligament under local anesthesia.